There have been a lot of movies being filmed here in Michigan over the past couple of years because of the lucrative tax and loan incentives for film production in the state. Apparently Sean Penn will be in Detroit making a new movie called "This Must Be The Place." 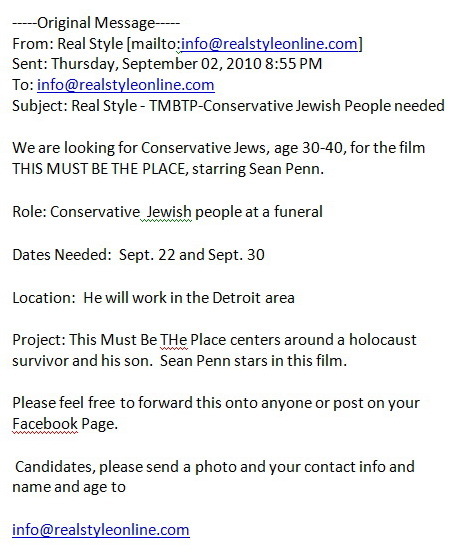 I just received an email message (see below) that the film is looking for extras for a Jewish funeral scene. I fit the description that they're looking for (I am a Conservative Jew, and I'm between 30-40 years old). The problem is that the two days they need these 30-40 year old Conservative Jewish people are Erev Sukkot and Shemini Atzeret respectively -- two major holidays on the Jewish calendar. 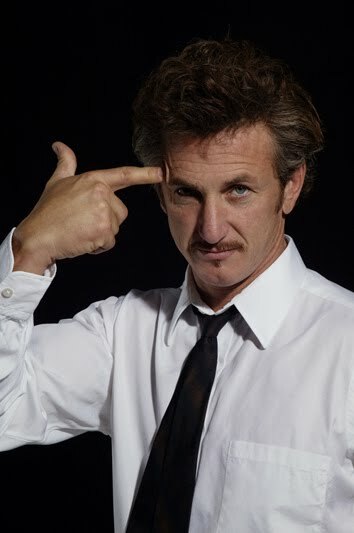 The movie, "This Must Be The Place," stars Sean Penn and is about a Holocaust survivor and his son. I guess when they decided to advertise their need for extras in a Jewish funeral scene, they didn't consult the Jewish calendar or they would have found that these two days are not the most ideal for the type of movie extras they're looking for. 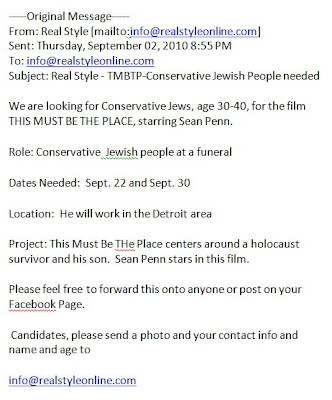 And, by the way, I'm wondering if the film's producer can explain how a Conservative Jew, which is based on ideology or synagogue affiliation, looks different on camera than other Jews. I guess they're looking for non-Hasidic looking Jews as extras in the movie and thought this was the best way to advertise it. Personally, I can't wait for this movie to be released so I can see if I know anyone sitting in the funeral when they should have been in synagogue for the holiday. LOL - How does a conservative Jew which is based on ideology look different than other Jews! !